A new musical production called Moon Landing is on stage at The Derby Playhouse from the 1st September to the 6th October 2007. Written and directed by Stephen Edwards it portrays the dramatic human story of the Apollo missions to the Moon, and is a world premier for Derby. The cast includes West End leads from Jesus Christ Superstar, the Phantom of the Opera, and Mary Poppins (as well as stars from other shows like Cats and Les Miserables). I first heard about Moon Landing from Professor Jonathan Powers of The University of Derby, who had attended an early sing-through of the first half and a read-through of the second half and recommended the show as a must see for DDAS members. I must admit that I have never been especially partial to musicals or shows as such. I am more of a play goer, and that mainly Shakespeare. Indeed, it took my sister to tip the balance when she asked if I would like to go along to the first night with her and my father. Having worked for a while in space science, and being a space buff anyway, (particularly when it comes to the Apollo missions) I suppose it was one not to miss, although my credentials could have made me the worst kind of critic! In the event, I was pleasantly awe struck. 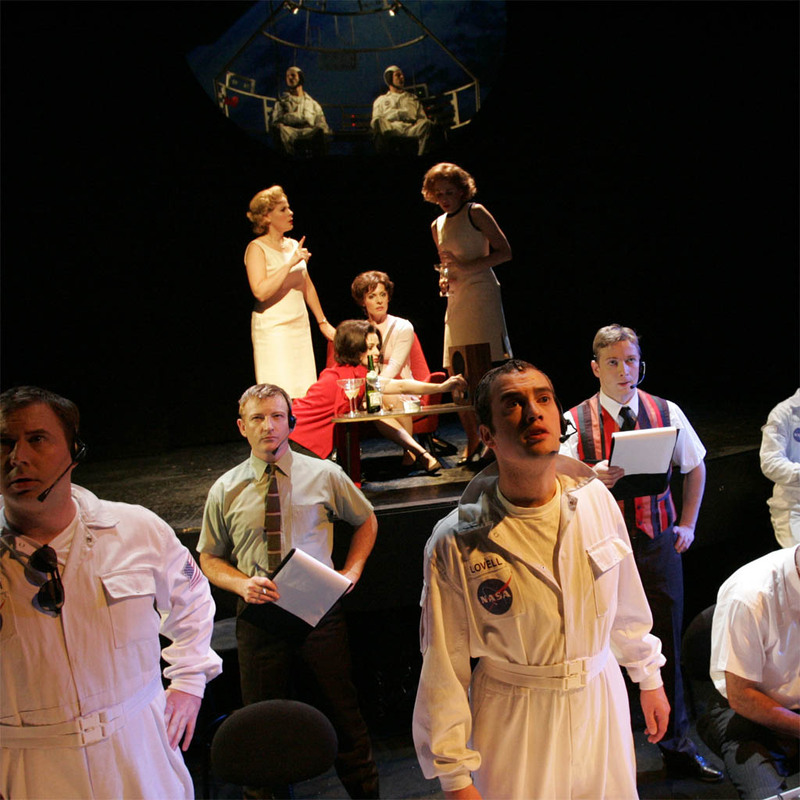 The show begins with a depiction of Yuri Gagarin’s epic flight into orbit and the American response. President Kennedy gives his historic speech…"I believe that this nation should commit itself...". The show moves on to cover the Mercury and Gemini flights before getting on to the Apollo missions. I was happy to find that the show is historically accurate and evidently very well researched. Indeed some of the dialog is taken from actual space-ground transmissions and not just the famous "one small step...". Clever use is made throughout the show of the 'orchestra pit' in front of the stage as mission control. A row of actors don headsets and sit as if manning a row of consoles. Quite appropriate really as this aspect of mission control was called 'the trench' during Apollo days. 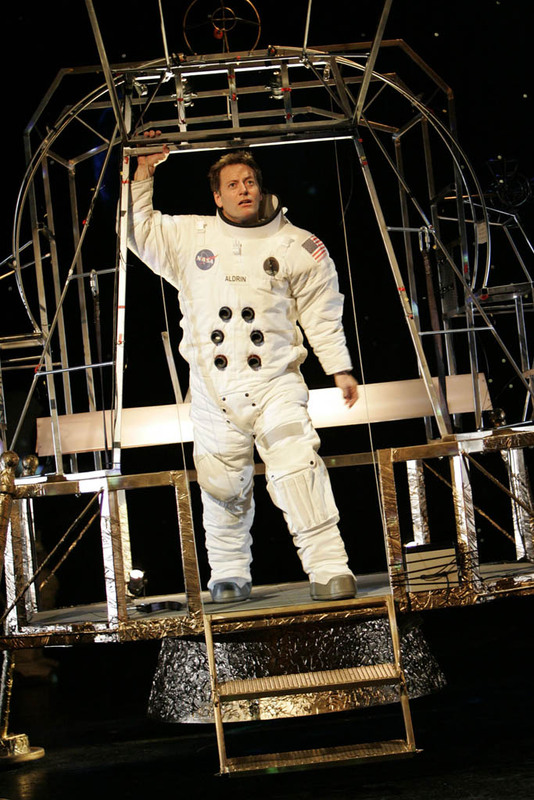 So how do you suspend disbelief in depicting spaceflight on stage? Well, you place the actors in open frame representations of the spacecraft and suspend them from the ceiling! This is not as corny as its sounds and worked quite well with the 'command module' doubling up for Gemini and Apollo. The lunar module was a separate affair complete with a 'working' descent engine. As the tension mounted during the Moon landing phase with fuel running low and 1202 program alarms (Apollo buffs take note) my disbelief was thoroughly suspended! What of the human side of the story? Well the characters are all real astronauts and managers, politicians and administrators. The astronaut’s wives are well represented and much time is spent on the drama of career versus marriage, triumph versus tragedy. We see the tableau of the family clustered around the TV set as Dad orbits the Moon. The astronauts return to Earth and cameras and microphones are thrust at our Moon voyagers to a chorus of "What was it, what was it, what was it, what was it, what was it, what was it like?". The music is well matched to the drama and makes a clever use of the same or similar theme at various places in the performance. Some of the music did tend to drown out some of the dialog at times though. The core of the drama centers around Buzz Aldrin’s personal journey through his moon landing experience and his subsequent breakdown post flight. Being the second man to set foot on the Moon did not sit entirely well with him and this is explored in depth. In fact my only major quibble with this production is that is does rather dwell on Buzz Aldrin’s problems and the negative psychological aspects of the moon landings for some of those involved. I say 'some of those involved' because many people may walk away from the show with the impression that the landings had a bad experience on all those who walked on the Moon or that Buzz Aldrin didn't recover. This is most certainly not the case. Take for example John Young who flew on both Gemini and Apollo and went on to command the first Space Shuttle mission. Or Pete Conrad, Dave Scott, Harrison Schmitt etc. who all had successful lives and careers post Apollo and certainly benefited from the experience. Anyone who enjoyed the film Apollo 13 or the HBO TV series From The Earth to the Moon will probably enjoy this show. If you are worried about the show being too technical don’t be, it isn’t and it certainly has 'something for all the family'. There is humour as well as tension, and the visuals work very well. In fact the whole show is quite spectacular. What a pity it is only running until the 6th October in Derby. Hopefully the show must go on...somewhere?